'The People's War' was a term applied to the Home Front in Britain during the World War II. One key feature of this was the Government's War Savings Campaign run by Sir Robert Kindersley. Savings groups were organised in local communities throughout the country to encouraged thrift at an individual level and bring together the community. There were large-scale campaigns in different years of the war, like the 'Spitfire Fund' (1940), 'War Weapons Week' (1941), 'Warship Weeks' (1941 / 1942), 'Wings For Victory Week' (1943) and 'Salute the Soldier Week' (1944). These campaign weeks involved a community being set a large monetary target, the idea being to save a sufficient amount of money to support airmen, sailors or soldiers. During the week, the organising committee arranged supporting events, which might include meetings about the war, speeches by decorated war heroes and visits by Government ministers or royalty. Generally speaking, each community met or surpassed its target by a combination of individual saving groups, insurance companies and local banks or other financial institutions. Overall, these campaigns brought together the local community and the service man or woman, united in their intention of winning the war. 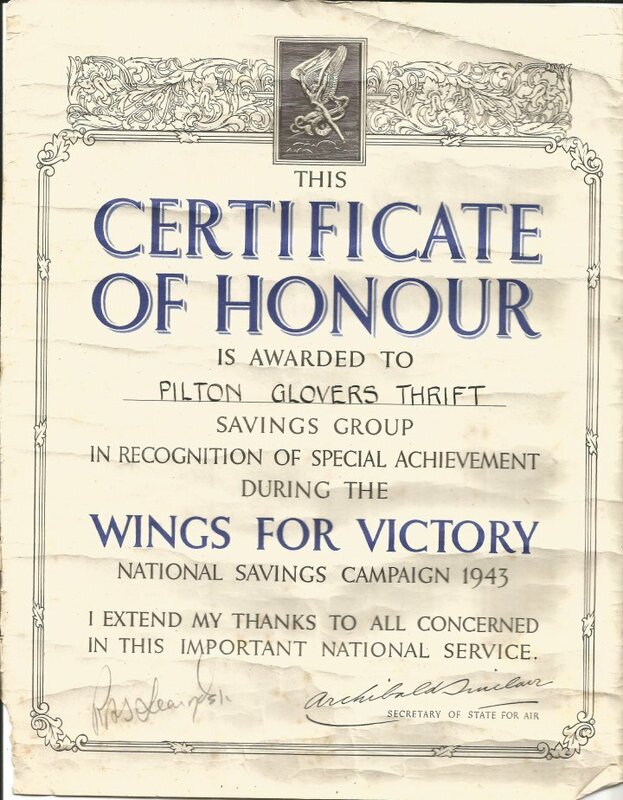 Some weeks or months after the campaign week, each community received a commemorative plaque and individuals and groups within the community were issued with an ornate Certificate of Honour, similar to the one for the 1943 ‘Wings for Victory’ shown here, which was awarded to the Pilton Glove Factory Thrifty Savings Group which involved Jane 'Jennie' Hobbs of Pilton who worked as a clerk, head of the export department and then as accountant in the factory until it closed in 1969. A similar Certificate of Honour was awarded in 1944 for the 'Salute the Soldier' campaign.